A penny for your thoughts? 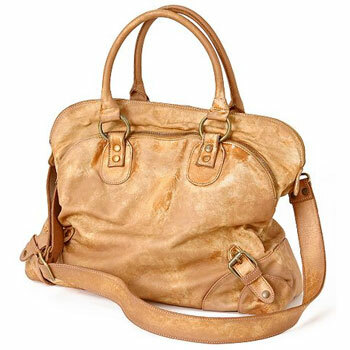 How about a penny-colored slouchy satchel? The 'Zero Below' Carryall by Giorgio Brato is an oversized duffel with a detachable shoulder strap, in a gorgeous washed copper colored hue. A distressed leather body is accented with reinforced edges, buckles and antiqued hardware. A simple shape gets double duty as a handheld tote, and shoulder carry-on bag. Buy it now at Anthropologie ($698).